High Wycombe Witness – Opposer : “You should be helping the homeless, instead of preaching”. Preacher : “Man shall not live by bread alone”. 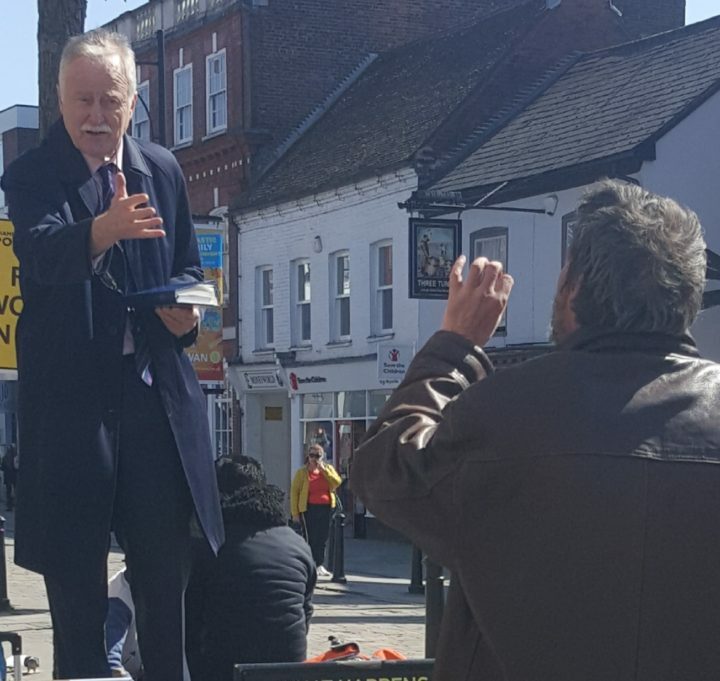 Pastors Peter Simpson and John Sherwood were preaching the gospel in High Wycombe High Street on Thursday 11th April, helped by church members at Penn. Many conversations were entered into and our tract on Jesus Christ, the Light of the World, was handed out to many passers-by. A passing Muslim expressed interest in the gospel, but his English was not very good, and so he was given a link on his phone to gospel tracts in Urdu. Some youngsters walked by as Pastor Simpson was preaching and one of them made a disparaging comment to the preacher, who immediately challenged him at full voice on the seriousness of the message. 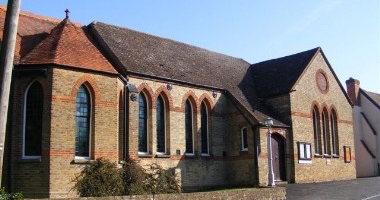 As Mr Simpson continued preaching, Pastor Sherwood, who was standing nearby, then went over to explain the gospel more fully to the young man and his friends, and it is hoped that he began to reconsider his initial dismissive attitude. Every opportunity was taken to stress the seriousness of sin. “Religion is responsible for wars” was one inevitable objection given against the preaching. “No, it is the sinners who rebel against God who cause the wars”, came the response. Mrs Hammond had a very encouraging conversation with a Roman Catholic lady who said very coolly about the gospel, “I have heard it all before”. Sister Eve, however, persevered with her testimony about nursing despairing dying atheists, and the lady obviously began to warm to Eve, and they ended up embracing one another, after having engaged in a lengthy, and we trust, profitable time of discussion. One young man came up to Pastor Simpson irate that we were preaching instead of “helping the homeless”. This was after Pastor Sherwood had already spoken to a homeless person sitting nearby (and to whom he may or may not have passed on some money, according to his discretion – see photo). The Penn minister responded to the opponent that he had no right to assume, having no knowledge, that we Christians had done nothing with our personal financial resources to help such people, but in any case, it is frequently the situation that people are homeless because of some kind of family breakdown, which in turn can be traced to human sin. This is no mere conjecture, but has been observed by actually speaking to homeless people and enquiring about their circumstances. The opposer then said that the homeless problem lay in the injustices in benefits system. Pastor Simpson replied, “Man does not live by bread alone”, but has an immortal soul which must be nourished. The antagonist then completely rejected all notion of man having a soul, and also cited Christian opposition to homosexuality as being cast iron proof of the invalidity of the preaching. Pastor Simpson replied that the human body is not designed for homosexual activity. The response received to this comment cannot be repeated here. The young man when asked also claimed to possess an essential goodness. He was challenged about this dangerous misconception. May the Lord be pleased to open his understanding to the corruption in the heart of all the fallen sons of Adam. We thank the Lord for the many opportunities of speaking of Jesus Christ and Him crucified which today’s witness afforded. May the seed sown bear much fruit.